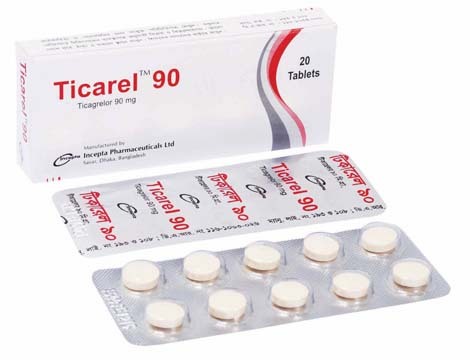 Ticarel 90: Each tablet contains Ticagrelor INN 90 mg.
Ticagrelor, a cyclopentyltriazolopyrimidine which is a reversible platelet aggregation inhibitor. Ticagrelor reversibly binds with the platelet P2Y12 adenosine diphosphate (ADP) receptor and thereby inhibits signal transduction and platelet aggregation. Ticagrelor is a P2Y12 platelet inhibitor indicated to reduce the rate of thrombotic cardiovascular events in patients with acute coronary syndrome (ACS) (unstable angina, non-ST elevation myocardial infarction, or ST elevation myocardial infarction). Ticagrelor has been shown to reduce the rate of a combined endpoint of cardiovascular death, myocardial infarction or stroke in ACS patients. In patients treated with percutaneous coronary intervention (PCI), it also reduces the rate of stent thrombosis. Initiate Ticagrelor treatment with a 180 mg (two 90 mg tablets) loading dose and continue treatment with 90 mg twice daily. After the initial loading dose of aspirin (usually 325 mg), use Ticagrelor with a daily maintenance dose of aspirin of 75-100 mg. Drugs that inhibit platelet function including Ticagrelor increase the risk of bleeding. Use of Ticagrelor with maintenance doses of aspirin above 100 mg decreased the effectiveness of Ticagrelor. Therefore, after the initial loading dose of aspirin (usually 325 mg), use Ticagrelor with a maintenance dose of aspirin of 75-100 mg.
Ticagrelor has not been studied in patients with moderate hepatic impairment. Discontinuation of Ticagrelor will increase the risk of myocardial infarction, stent thrombosis, and death. Pregnancy Category C, There are no adequate and well-controlled studies of Ticagrelor used in pregnant women. It is not known whether ticagrelor or its active metabolites are excreted in human milk. No dosage adjustment is needed in patients with renal impairment. Patients receiving dialysis have not been studied.